In modern times like these kids quickly learn how digital games like candy crush work. This makes the biggest part of the game quickly accessible. 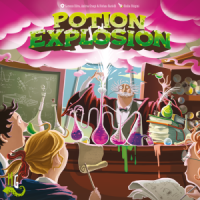 The problems with this game are the extra rules that get added to the game like ‘help from the professor’ or the extra points for 3 of the same or 5 different potions. This also make the game quite longer and harder to keep their attention. What we did was the following. We ditched everything based on points like -2 and +4 and changed the rules to the first who completes 5 potions. Due to the rule change the game becomes a lot shorter in time. This also makes them think more about what potion they should get next after a completion. Do they choose one that requires almost no marbles or do they choose one where they could use their spares from the Erlenmeyer. Based on their age you could also add the fact if they can use the potions or not. This is entirely up to the parent, but you can always help them to remind them what the special powers are. MilkSjeik’s tip regarding scaling down the rules is well spent, and heeded, thank you! We only removed the Potion Powers, and it is a well-loved, frequently requested game. Okay, the rules say players will keep marbles on their hand while picking them up. But in reality, for some people this is a hard thing to do. My experience told me that some people having the difficulty to hold the marbles in their hands. So during the game some people cannot keep the marbles inside their hands, spur them all into the table or worse out of the table. You know how marble goes. So I had the idea to give each player a storage, a bowl (I use a plastic bowl) as a temporary storage for people when picking up the marbles. This is proven to be quite effective. So this can give you solution if you’re having this kind of issue. For the first time you need to assemble the Dispenser (it’s the huge thing where you put all the marbles when you’re playing the game). The dispenser needs extra attention to build but not a tricky one, just need more time to tinker with. The good thing, the box has special insert made for the game that you can put the dispenser inside the box without having to disassemble it again. Easy storage, bravo. But when I get a grip on it, I think it’s too fragile and it needs to be glued so it won’t fall to pieces. So glue the dispenser is a good idea, since you won’t disassemble it ever again.